While the theory that a frustrated rock star is trapped inside the body of every able music journalist could be debated until the cows come home, there have certainly been instances where ambitious members of the media have laid down pen – or laptop – and strapped on a guitar for the greater good. Alan McGee’s legendary Creation imprint, for example, released highly collectable vinyl from Jerry Thackray (aka influential NME journalist Everett True) and future Sounds correspondent John Robb’s post-punk combo The Membranes, while The Loft – further hotly tipped contenders from McGee’s stable – consisted of no less than three part-time music scribes. Also regulars in print during the late 80s were two highly respected writers who arguably left a more lasting impression on the British pop scene over the next decade. Friends since childhood, Bob Stanley and Pete Wiggs had both been involved in an acclaimed indie-pop fanzine called Caff during the mid-80s, before Stanley (who has since written for The Times and The Guardian) went on to become a regular contributor to UK rock weekly Melody Maker between 1989 and ’91. Fans of an eclectic array of sounds from the pop world past and present, the pair collectively conceived their own outfit, Saint Etienne (copping the name from top_flight French football team AS Saint-Etienne) with the intention of making euphoric, chart-friendly records that alchemised 60s soul and classic British pop with 70s dub and dabs of acid and deep house. The duo timed their entrance into the marketplace to near perfection. With the Madchester explosion having recently made stars of bands such as Happy Mondays and The Stone Roses, and DJ Andrew Weatherall’s influential remix of Primal Scream’s ‘Loaded’ kicking open the door for the indie-dance revolution on the cusp of the 90s, the charts were awash with trippy, dancefloor-friendly 45s when Saint Etienne recorded their first song: a smart cover of Neil Young’s ‘Only Love Can Break Your Heart’, built upon breakbeats, Italian house-style piano figures and a seductive vocal from Moira Lambert, formerly of indie contenders Faith Over Reason. 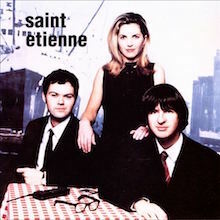 Reputedly recorded in producer Ian Catt’s bedroom in just two hours, the song snagged Saint Etienne a deal with Jeff Barratt’s hip Heavenly imprint and was released as the band’s first 45, climbing to No.95 on the UK chart. Lambert’s vocal performance was widely praised, but Stanley and Wiggs had actually conceived Saint Etienne as a collaborative project, so their second Heavenly 45, ‘Kiss And Make Up’ (adapted from UK indie outfit The Field Mice’s tune ‘Let’s Kiss And Make Up’), featured vocals from Donna Savage, on loan from New Zealand popsters Dead Famous People. 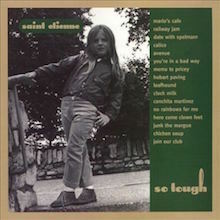 The third Saint Etienne single, May 1991’s ‘Nothing Can Stop Us’, again featured a different female vocalist, Chelmsford-born Sarah Cracknell, who had previously performed with Windsor-based indie foot soldiers The Worried Parachutes, and cut several singles during the late 80s with a band called Prime Time. Wiggs and Stanley’s collaboration with Cracknell was also intended as a one-off, but the trio clicked from the off, and ‘Nothing Can Stop Us’ – which leant on a smartly deployed sample from Dusty Springfield’s version of ‘I Can’t Wait To See My Baby’s Face’ – was so positively received by the critics and performed so well commercially (cracking the UK Top 75 and appearing in America’s Dance Charts for a week) that the trio continued working together full-time. Saint Etienne scored a lot of crucial support in the UK rock weeklies NME and Melody Maker, and their Heavenly Records debut, Foxbase Alpha (reissued in a 2CD Deluxe Edition during 2009) reflected the band’s growing popularity when it charted at No.34 in the UK upon its release in September 1991. A pleasingly eclectic affair, the LP demonstrated the band’s love of everything from classic 60s pop (‘Nothing Can Stop Us’, ‘Wilson’) to reggae (‘Carnt Stop’ (sic), based upon 70s producer Glen Brown’s ‘Youthman’ rhythm) and longer, ambient-tinged outings such as ‘Stoned To Say The Least’, which recalled The Orb at their amorphous best. The band went one better with their second LP – and arguable career best – So Tough, which was released through Heavenly in March 1993, charting at an impressive No.7 in the UK. As with Foxbase Alpha, the LP was granted a Deluxe Edition 2CD release in 2009, with a raft of B-sides and bonuses, and it remains an accomplished and beautifully crafted pop LP, chock full of infectious melodies and topped off by Cracknell’s alluringly dreamy vocals. The album’s name derived from The Beach Boys’ 1972 LP, Carl And The Passions – “So Tough”, and it also ingeniously utilised clever samples of dialogue from cult movies such as Lord Of The Flies, Billy Liar and The Picture Of Dorian Gray as links between its tracks. Andy Weatherall’s dub-infused remix of ‘Only Love Can Break Your Heart’ had previously (if briefly) introduced Saint Etienne to the UK Top 40, but So Tough also spawned an impressive quartet of hits courtesy of the wistful ‘Avenue’, ‘Join Our Club’, the double A-side ‘Hobart Paving’/‘Who Do You Think You Are?’, and the irresistible, Bruce Forsyth-referencing ‘You’re In A Bad Way.’ The latter – which was given a makeover by ex-Cliff Richard producer Alan Tarney for its 45RPM release – rose to No.12, giving Cracknell, Stanley and Wiggs their first Top 20 hit. Issued in June 1994, Saint Etienne’s third LP, Tiger Bay, was their last for Heavenly. Most of the songs were initially conceived in the rural isolation of Gloucestershire’s Forest Of Dean, and a number of them – not least ‘Former Lover’ and the haunting traditional English folk song ‘Western Wind’ – had noticeably rootsier leanings. Elsewhere, ancient and modern clashed to staggering effect on ‘Like A Motorway’, which melded Kraftwerkian proto-techno and the melody from 19th-century folk song ‘Silver Dagger’, demonstrating that, stylistically, the sky was still the limit for the band. Tiger Bay also bequeathed two of St Etienne’s most enduring Top 40 hits in ‘Hug My Soul’ (co-penned by Sarah Cracknell and songwriting duo Guy Batson and Johnny Male) and the exotic ‘Pale Movie’, which ingeniously blended a Euro-dance backbeat with Spanish guitars and was promoted with a memorable video of the band riding scooters around Nerja in the Spanish province of Andalusia. The trio’s close relationship with commercial success continued with 1995’s self-explanatory Too Young To Die: The Singles 1990-1995, which climbed to No.17 in the UK charts. Its spirited performance earned the band a silver disc for sales of over 60,000 copies, as well as an upbeat, dance-enhanced Top 20 UK hit, ‘He’s On The Phone’, which was written and performed in collaboration with French singer-songwriter Etienne Daho. The CD came with a bonus second disc featuring a raft of B-sides and remixes, which was later released as the standalone collection Casino Classics, and reached No.34 in the UK on its own merits. Saint Etienne transferred to Creation Records in 1996, but their lone LP for the label, Good Humor, only materialised in 1998, partly because Alan McGee’s team were committed to promoting Oasis’ massive-selling third LP, Be Here Now, in the summer and autumn of 1997. Recorded at Tambourine Studios in Malmö, Sweden, with The Cardigans’ producer Tore Johannson, Good Humor continued the move away from the band’s trademark synth-driven indie-dance sound that had begun with Tiger Bay, with Johannson bringing in a full band, including a horn section. The LP was still suffused with delectable pop, however, not least the dub-infused ‘Wood Cabin’, the shimmering ‘Lose That Girl’, and ‘Sylvie’, which peaked at No.12 in the UK Top 40 singles chart. Its parent album rose to No.18 in the UK Top 20 and also sold well in Scandinavia, where it climbed to No.11 in Norway. The band greeted the new millennium with Sound Of Water, released through Beggars Banquet subsidiary Mantra in June 2000. Recorded in Berlin, with arrangements from post-rock duo To Rococo Rot and The High Llamas’ Sean O’Hagan, it was something of a stylistic departure, with dreamy, ambient textures and electronica largely usurping the warmer, poppier feel of Good Humor. The LP’s ambitious (unedited) nine-minute trailer single, ‘How We Used To Live’, narrowly missed the charts, though third single ‘Boy Is Crying’ rose into the Top 40, as did Sound Of Water, which eventually peaked at No.33 in the UK. Saint Etienne have continued to enjoy considerable acclaim this side of the millennium. Though it also contained a couple of typically ravishing pop tracks such as ‘Stop & Think It Over’, much their next LP, 2002’s Finisterre, continued to explore the ambient electro-vibe of Sound Of Water and peaked at No.11 in the US Top Electronic Albums chart. 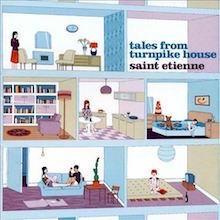 Akin to the content of Scott Walker’s ’Til The Band Comes In, meanwhile, Tales From Turnpike House (issued in 2005 and released by Sanctuary) consisted of tracks depicting characters who lived in the eponymous block of flats (which actually exists and can be found on London’s Goswell Road). The record itself boasted some fabulous music, including ‘Stars Above Us’ and the dancefloor-friendly ‘A Good Thing’, as well as a surprise guest vocal from 70s pop star David Essex on ‘Relocate’. 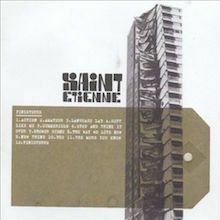 Featuring an extensive two CDs that took in the band’s hit singles, album tracks and remixes, plus a bonus DVD of promos, Heavenly’s career-spanning anthology, London Conversations: The Best Of Saint Etienne, appeared in 2009, followed by Words And Music By Saint Etienne. Released by Universal Music/Heavenly in May 2012 – and, to date, the band’s most recent fully fledged studio LP – this latter contained some of the trio’s most well-executed songs, ranging from the nostalgic ‘I Threw It All Away’ to the Northern soul-esque ‘Haunted Jukebox’ and the memorable single ‘I’ve Got Your Music’, which neatly referenced Donna Summer’s 1977 hit ‘I Feel Love’. 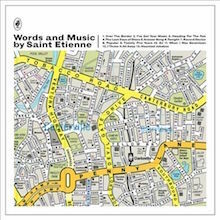 Attracting almost universal acclaim from critics, Words And Music By Saint Etienne sold strongly from the off and deservedly reacquainted this most enduring and inventive of modern pop bands with the UK album charts, climbing to No.26 within weeks of its release. Cracknell, Stanley and Wiggs have been busy with side projects in the interim, but reconvened to supply the gorgeous, introspective soundtrack to director Peter Kelly’s acclaimed 2014 film, How We Used To Live: a fascinating celluloid history of London put together using footage from 1950-80. Saint Etienne have since performed the soundtrack at sold-out shows at London’s Barbican Centre and at the Sheffield Doc Centre, and took the same set around the UK on a five-date mini-tour in May 2015. Meanwhile, with a number of special festive showed staged in December 2015, and hints of new material in the wind, St Etienne may be in for further skirmishes with the Top 40. 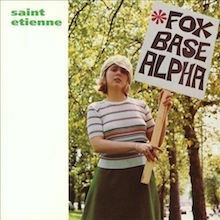 Despite a handful of classic pop singles, Saint Etienne's debut album Foxbase Alpha is a tentative fusion of club culture and swinging '60s pop. Lead vocalist Sarah Cracknell hasn't been fully integrated into the band's lineup -- she doesn't even sing on their astonishing Euro-disco cover of Neil Young's "Only Love Will Break Your Heart," which is not only cleverly ironic, but also works -- yet the filler remains thoroughly enjoyable, even if it rarely reaches the heights of the irresistible girl group pop of "Kiss and Make Up." 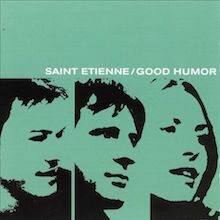 Good Humor has Saint Etienne back cooking up more delectable lolli-pop. From "Woodcabin," the dubby, bass-heavy opener, Good Humor is a typically arch Saint Etienne album full of easy-listening dream pop. Tracks like the shimmering "Lose That Girl" and the swirling "Erica America" show Saint Etienne at its melancholic best. There are, predictably, some near misses such as the Beatlesque "Mr. Donut," which is as sweet as a strawberry field but fails to deliver the melodic promises made by the smart atmospherics. "Goodnight Jack," with its pastel-shaded flute loops and subtle breakbeats, has a positively cooler-than-cool feel and a wrenching change of pace toward the middle of the song. Sure, Good Humor is clever, perhaps overly so, and yeah, it's full of the Et's contrived coyness and we-know-more-than-you attitude, but it's good stuff. Sometimes you just want to put on a disc, sit back, and let it carry you off to someplace else. If that's all you're looking for, Good Humor is sweet ear candy. 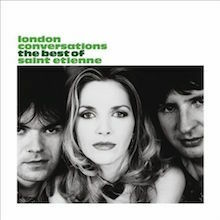 Ten years on, Saint Etienne found themselves at a bit of a crossroads. They had long ago stopped having hits in the U.K., settling into a cult audience in both their homeland and the U.S. There isn't an inherent problem with having a cult audience, but cult bands often have the stigma of being on the cutting edge. At the start of their career, Saint Etienne was on the cutting edge. Their first two albums were at the foundation of many '90s pop trends, including the revival of swinging '60s London, the unabashedly melodic bent of Brit-pop, the fascination for forgotten easy listening artifacts from the '60s, the kaleidoscopic blend of '60s sound and '90s sensibility later heard on Beck records, plus the insurgent twee-pop of the late '90s. For their tenth anniversary, they decided to reclaim the cutting edge with Sound of Water. The album strove to keep the concise, song-oriented focus of Good Humor, while expanding the horizons of their music to focus on abstract, dreamy, electronic sounds. There are moments of pop pleasure here, surrounded by spare, languid electronica sections, vaguely reminiscent of the High Llamas. This is where maturity pays off. Saint Etienne never lingers too long in one area, letting the album flow gracefully between these two extremes and placing some very good pop melodies along the way. There are no knockout singles on par with those from So Tough or Tiger Bay, but Saint Etienne has pretty much given up on the pop charts, preferring to concentrate on cohesive, stronger albums. That may mean that Sound of Water simply isn't as exciting as their earlier work, and it also means that there isn't a good gateway song to the record. But that's OK, since with repeated plays, Sound of Water reveals itself as a first-rate effort. 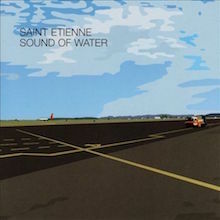 Saint Etienne's eighth record, Words and Music by Saint Etienne, is centered on a theme that has been part of their music since the group began. They've always been one of the most nostalgic groups around, draping themselves in the visuals, styles, and sounds of the past while still staying modern. They've rarely seemed to be touched by the past on a personal level, but now perhaps age and experience have given them a reason to look back at their own lives and do a bit of summing up. Fortunately, this bit of soul-searching self-awareness isn't delivered via somber, acoustic guitar-based navel-gazing; instead, it comes coated in disco synthesizers and a slickly done production job (by a team of the group, longtime associate Ian Catt, Richard X, and Xenomania's Tim Powell) that positions them firmly in the Pop (with a capital P) world. About half the record is drenched in nostalgia, vaguely melancholic and introspective. The first track, "Over the Border," wistfully talks about growing up, falling in love with music, and wondering if it will last; elsewhere, Sarah Cracknell sings about bad choices ("Twenty Five Years," "I Threw It All Away"), and on the atypically '80s rock-inspired "When I Was Seventeen," they make the nostalgic nature of the album very clear. The nuanced melodies, heartfelt lyrics, and Cracknell's tender vocals put these songs over splendidly and give the album a sturdy emotional core beneath the glitzy surface. The other half of the album is built on bouncing beats, glittering synths, and Cracknell's feather-light vocals, and is designed to be played over radio waves and in sweaty nightclubs. This half of the album speaks to the power of music to sweep you away, fill you with hope and love, and make everything all right. To that end, the group also succeeds and crafts some of its finest dancefloor-filling moments ever; Sarah Cracknell has never sounded better than on the flashy "The Last Days of Disco," "DJ" has a nice callback to the melody of "Like a Motorway," and "Haunted Jukebox" sports a mid-'60s soul groove and some lushly lovely backing vocals. Songs like these really do capture the transformative qualities the best music can have, just as the ballads on the album transmit all sorts of deeper feelings of loss and regret. These dual aspects of the record mesh perfectly, often on the same song, and Words and Music turns out to be one of the band's most enriching albums, both musically and emotionally. A return or a retread? Regardless of where you stand with this group as a fan (whether you detest Good Humor and Sound of Water or not), it's a bit of both. Those who've been waiting nearly a decade for the group to return to the messy but masterful patchwork anti-formula formula of the first three albums should be happy with this one. Like So Tough and Foxbase Alpha, the flow of the album is charmingly disjointed and seemingly made up of tangents -- albeit the kind of tangents for which most pop groups would happily exchange their Sarah discographies in order to call just one their own. In that sense, Finisterre is a return, forsaking the unified approaches taken on both Good Humor and Sound of Water. But the album resembles what many longtime fans would call a blatant return -- a return in lieu of new ideas (to borrow). The group's bright and shimmery dance-pop instincts are practically oozing out of one-third of these songs, though none of them quite scale the heights of the group's best material. If another third of the album didn't sound like it could've only been made in the wake of the electro (not electro) revival, it could've been released at any point during the latter half of the '90s. The remainder of the album, along with some of the electro-leaning material, mines melancholy and occasionally dark territories. In fact, there are no sweeping string arrangements, no delicately strummed acoustic guitars, and nary a whistle-worthy melody within the album's last four songs. Still, Saint Etienne remain England's best pop group -- they only look bad when they're compared to themselves, and this album, for all its shortcomings, has a handful of moments capable of making you think that they are the best pop group to have ever existed. St. Etienne's second album, So Tough, is a remarkable step forward from Fox Base Alpha, boasting a stronger set of songs and a sharper focus. Not only are the pop melodies catchier than before, the group's mastery of swinging '60s arrangements and Eurodisco rhythms is positively infectious, and Sarah Cracknell's light, airy vocals are alluringly dreamy, giving the record a wonderful, floating quality. The cool club beats, occasional samples, and synthesized textures provide an inviting sonic backdrop for Bob Stanley and Pete Wiggs' infectious pop songs, and while the singles "You're in a Bad Way" and "Hobart Paving" stand out, there are several other tracks here that are nearly as good, making So Tough an irresistible set of danceable, well-constructed pop. The trio Saint Etienne (songwriters/musicians Pete Wiggs and Bob Stanley and vocalist Sarah Cracknell) has been a popular fixture in the British indie dance scene since the release of its debut album Foxbase Alpha in 1992. Combining '60s-influenced pop and the acid house rhythms of the British club scene, the band has scored with a series of successful European albums and singles. Saint Etienne has also earned critical acclaim and a loyal cult following in America (particularly in dance clubs), though U.S. commercial success has been elusive. Saint Etienne has released a series of strong albums since the early 1990s. Continental is a superb collection of mostly previously released material, and it's a nice introduction to their solid body of work. Their strong points are the combination of atmospheric (yet accessible) arrangements and Sarah Cracknell's '60s girl group cooing. However, her vocals are not derivative or cutesy, instead lending substantial personality to the material. "Burnt Out Car" and "He's on the Phone" benefit greatly from her performances, mainly because Saint Etienne rarely incorporates obvious pop hooks. Rather, the band relies more on rhythm and personality, making it considerably more complex than the average pop/dance band. Continental's best track is a house cover of Gary Numan's "Stormtrooper in Drag" (it previously appeared on a Gary Numan tribute album), which is odd in concept but surprisingly effective. Fortunately, Continental surrounds that tune with equally competent Saint Etienne originals. Any of the group's studio albums, particularly So Tough and Tiger Bay, will serve as a nice introduction to the band's music, since the trio's best albums stand on their own quite nicely. 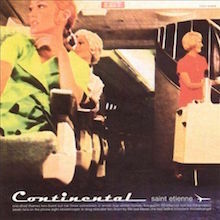 However, various collections of singles, remixes, and rare material have also been released, and Continental is by far one of the best. Highly recommended. Die-hard Saint Etienne fans have all of this stuff but, for the casual explorer, Heavenly's 2008 collection London Conversations: The Best of Saint Etienne is the best place to catch up and fall in love. Covering everything from their first single through 2002's Finisterre, London Conversations offers up a good spread, with hits and obscure B-sides occupying equal territory. The running order runs (mostly) chronologically on each CD, but the sequence flows well enough that the "mx-tape" vibe remains hip-ly intact for the listener.